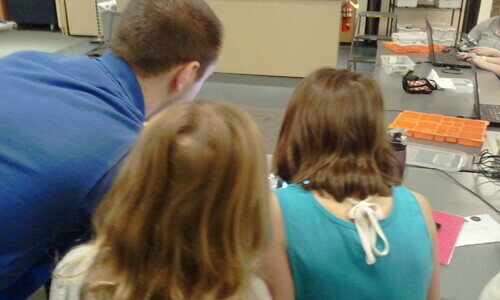 This afternoon we attended a robotics class at the Great Lakes Science Center in Cleveland. The kids put together a LEGO Mindstorms robot and programmed it to perform a variety of tasks, including moving along a curved path. 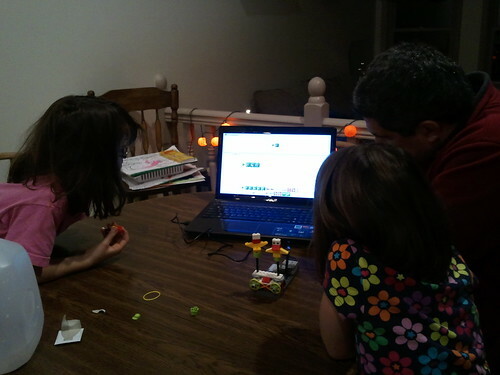 Some of them got a little discouraged with the programming part. 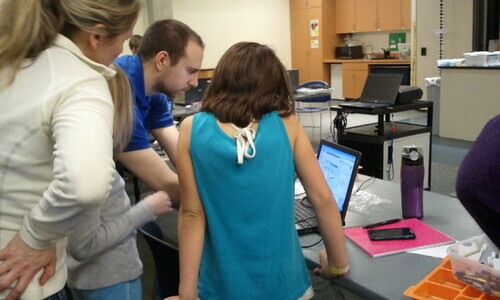 We may try to schedule this class again as a group tour, so the kids have a chance to try programming again. Assembling the robots was not a problem, but the computer portion was unfamiliar and therefore a bit more challenging. 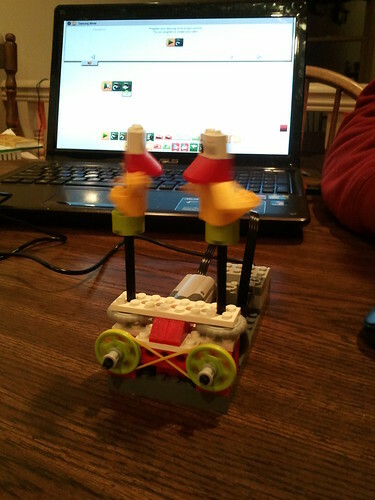 Tonight we did the first of the activities in the LEGO WeDo set: Dancing Birds. First you watch a little movie that sets up the scene. 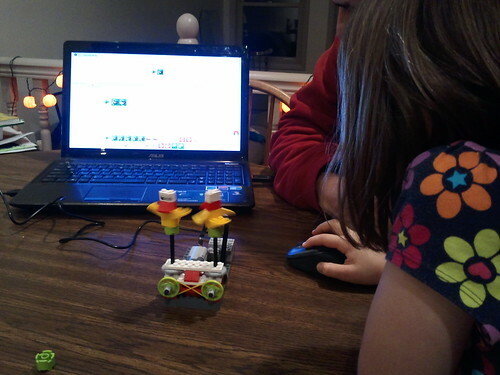 Mia and Max, two LEGO characters, are looking at a pair of dancing birds (they actually spin, but who’s counting?) The birds are spinning in the same direction. You have to build the model and get the birds to spin, then you have to figure out how to make them spin in opposite directions. 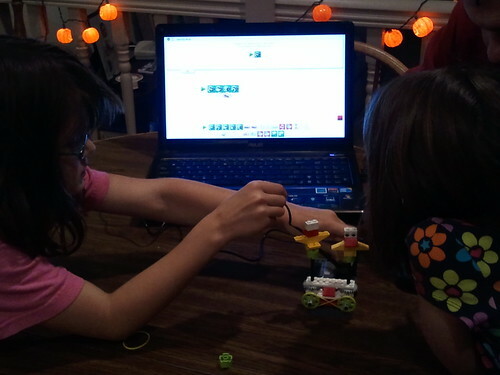 The girls grasped the concept of driver and driven gears right away (the LEGO set calls them “driver” and “follower”, though I guess in engineering they use slightly different jargon, according to DH). They understood that only one of the birds was connected to the motor, that the other bird was moving because it was connected to the first bird by the pulley. And they also figured out very quickly that they needed to put a twist in the pulley belt to get the birds to spin in opposite directions. So quickly, in fact, that I didn’t even get a picture of the pulleys connected with the untwisted belt. Sheesh. 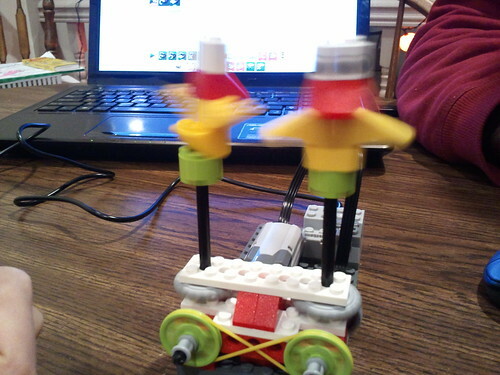 At first, we used the software’s program for the motor (basically just an infinite “motor this way”). Then the girls got fancy with different speeds and directions. 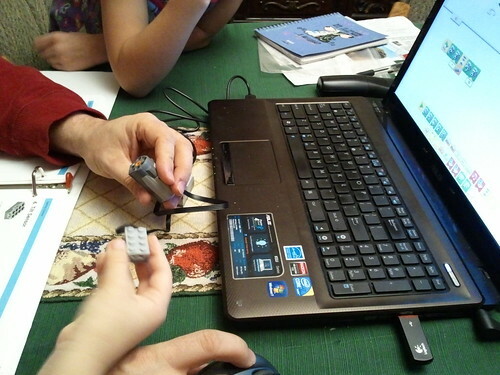 WeDo Math, Violin and LEGO! Today we worked on our math. Yesterday S8 finished lesson 15 and had a test. 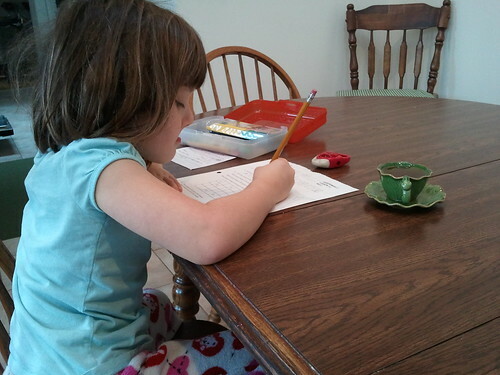 O6 is one lesson behind, so she had her lesson 15 and test today. We really like the Saxon math program. I like the repetition and the fact that we are regularly revisiting earlier material so it doesn’t get “forgotten”. We do an activity with the calendar, clock and thermometer every day. We also do a pattern of the day and use a lot of manipulatives to keep it interesting. 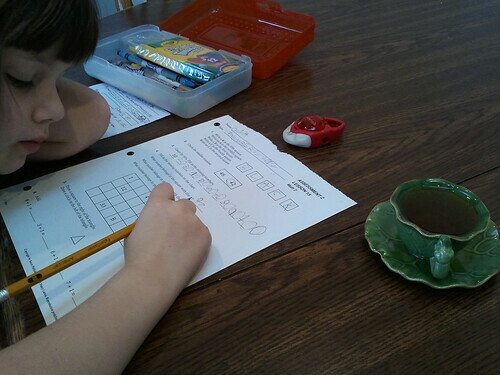 There are a few things I don’t care for, like the “some, some more” concept of addition, which I find totally superfluous since both kids already know how to add and subtract two-digit numbers. But we gloss over the few things that are fluffy and concentrate on the big concepts. While one girl is doing math with me in the kitchen, the other one practices her violin in the living room. 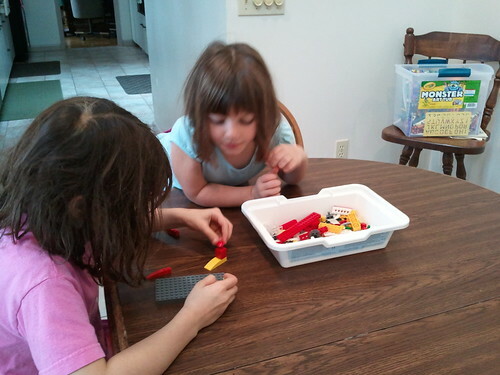 We knock out both of those in less than an hour, which leaves us the rest of the day to do reading, writing activities, and other things… like LEGO! The Excavator has a remote control, but not computerized programming. Now, they’ll have a chance to combine a mechanical process with computer programming. This means we can start thinking about robots! 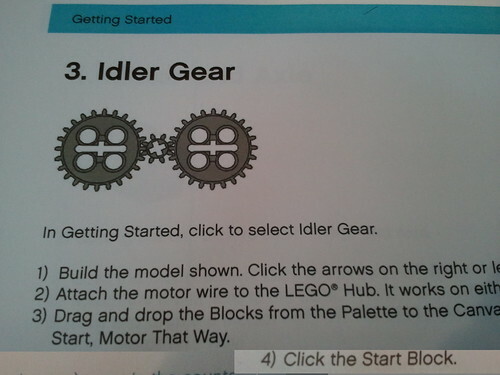 Today, we went through the “Getting Started” sections on gears. We learned about the drive gear, follower gear, and about idler gears. We also learned gearing up and gearing down. Next time, we will learn about pulleys. 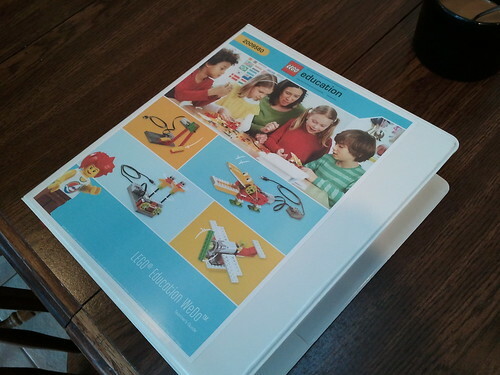 Some time ago, we bought a LEGO WeDo set. 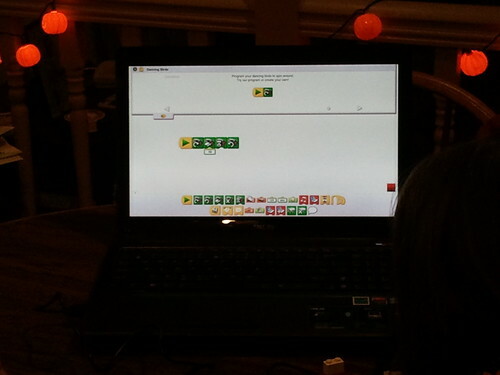 The WeDo sets are available through LEGO Education and are used to introduce mid-elementary kids to robotics. 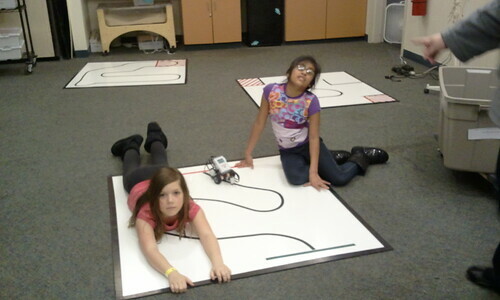 Through a series of activities, you build mechanisms and program them to solve a variety of problems. Last night, I decided it was time to try it out with the girls. I installed the software on my laptop and played around with it a little bit after they had gone to bed. 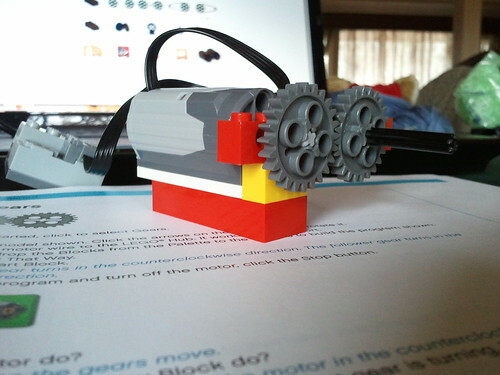 I learned how to tell the LEGO motor to turn in different directions, at different speeds, or for a certain amount of time. There is a tilt sensor, which can be used to perform an action when the sensor is tilted in a certain direction or when it is level; there’s also a motion sensor for performing actions when the sensor is near (or not near) another object. 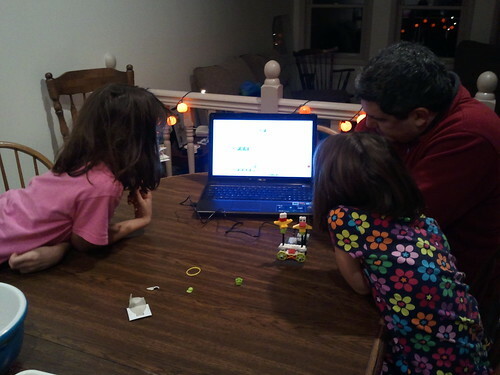 Today, I showed them briefly how it worked, and they were very excited to try it out. 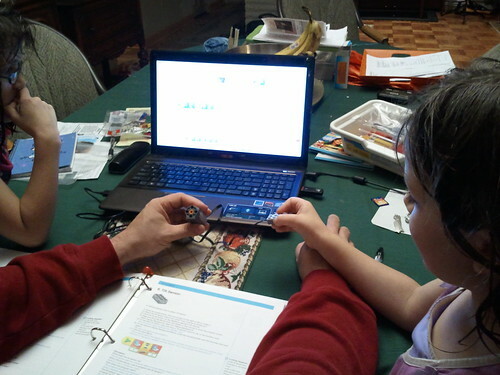 So, after dinner, DH sat down with the girls and they experimented with programming the motor. No mechanisms, just setting up a series of commands and then predicting what would happen to the motor. They loved it. Here we are trying out the tilt sensor, which O6 is holding while DH holds the little motor. We told the computer to turn the motor when the sensor was tilted up, and it did exactly that! 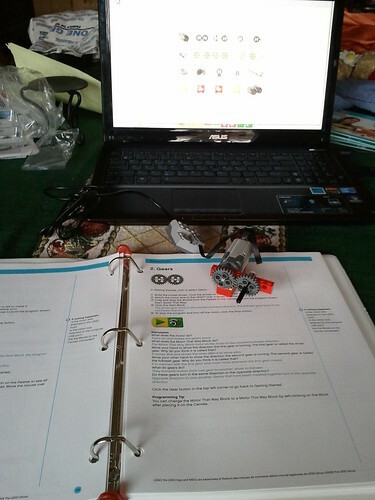 Now that the kids have figured out the basics of how to program, we’re going to go through the “getting started” series of activities, which will let them combine the motor with a variety of gears, pulleys, and other systems. Then we can get into some of the actual mechanisms. Earlier tonight, we went to gymnastics. O6 has 15 stickers and S8 has 18. They are about halfway through their level already. Tonight they worked a lot on the balance beam and vault.